This home staging job South Carolina is your chance to help a home seller who has already taken a $10,000 price drop. 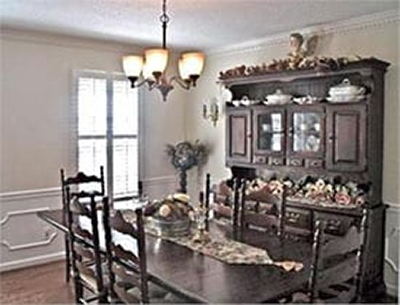 I’ve viewed the MLS listing online and provided this dining room photo to give you an idea what you’ll be working with. This 3,096 square foot home is on a lovely treed lot and has already been reduced to $229,900. It has 4 bedrooms, two full bathrooms and one powder room. From the real estate agent listing photos I can see that all the rooms are furnished already, so you’ll be working with what the client already has. Some of the rooms seem overcrowded, while others need some decorative accents. The home seller wrote me looking for a Staging Diva Graduate after the $10,000 price drop failed to sell her Columbia South Carolina home. Penny recognizes she needs a home stager’s touch if she’s going to sell her home this summer. You’ll be working for her directly rather than her real estate agent (an arrangement I always find best in my own home staging jobs). This home staging job will make an awesome addition to your home staging portfolio and could be a terrific home staging success story to share with future clients. After all, you’d be able to talk about how long it was on the South Carolina real estate market and how it wouldn’t sell, even with a price reduction, until you turned it around with your home staging advice! Apply for this South Carolina home staging job couldn’t be easier. Simply complete the form at the Staging Diva Home Staging Project Referral Service. Please be sure to include “Home Staging Job South Carolina” as the project location in the first line of the form. This South Carolina home staging job will be referred first to members of the Staging Diva Directory of Home Stagers for free. In other words, there will be no referral fee for Directory members even though we’re playing “match maker” for you. If you get any paid work through this referral (and you’re not already a Staging Diva Directory of Home Stagers member), there will be a $100 referral fee, which you can build into your home staging consultation fees. It’s entirely up to you. Not quite ready for prime time…my heart skipped a beat or two to see this staging opportunity in Columbia, SC – 1 hour from my area in Augusta, GA. I completed the Staging Diva Training program 2 years ago in anticipation of my corporate job elimination. Two years later, I’ve just recently closed out the corportate job and closed a 30 year career in the finance industry. I am working through the logistics to launch my new career and passion as a property stager. I have my URL and business set up and registered with our state and county. On the “to do list” : build portfolio, register with Staging Diva Directory, link URL to Staging Diva Directory…I completly understand that you have pre-requisite to have these necessary and important components in place for your referrals. You need to protect your brand! Maybe next time….looking forward to working with your organization very soon. Consider this a sign, that it’s definitely time to get your portfolio together. I realize this may be tricky with the holiday weekend, but if you can get 3 sets of before and after shots done (even in your own home), and write about 600 words of copy about you/your business then you’re almost ready for your listing in the Staging Diva Directory of Home Stagers. It’s actually possible that this project will still be waiting for you if you get everything together over the next several days! It only takes us a maximum of 7 days to have your listing ready for clients to see from the time we receive your materials. Click here to learn about how to join the Staging Diva Directory of Home Stagers with a profile listing that includes a FREE custom brochure for your company. Also, please check out the Staging Diva Ultimate Portfolio Guide. It will help you write about yourself effectively and get all your photos together quickly. Karla, I know it’s probably a real mindset shift to leave a 30 year career in the finance industry, but many cool things await you. Donna Dazzo did the same thing after she was laid off and she’s now in her 6th year in business having appeared on HGTV and in magazines, etc. She’s got an awesome home staging business. I know you’ve probably seen some of the articles I’ve written about her since she took my training program. You’re such a great coach! Always with spot on comments and encouragement. Exactly what I was thinking when I saw your SC project posting…”is this a sign?” I’m going to switch to high gear! Even if this homeowner has been guided to a successful sale, it will be several “to do” items checked off MY project list! Thanks for all you do! Thanks so much Karla for that feedback, I really appreciate it!! Good luck getting your stuff together. After multiple stops & starts I have signed up to get the website designed. I’ve had the domain, business name, & license since January. I’m trying to do the before and afters this week, max 2 weeks. I looked up the house on MLS a few nights ago, and it was still up for sale. If it’s meant to be, it will be. I am going to link the website to your directory. I”ll keep you posted. My directory profile was published yesterday. Do you know if this Columbia, SC project is still open? Karla, Please follow the instructions in the post so that your information can be routed to the client properly if this position is still open. Thanks and congratulations on joining the Staging Diva Directory! I have been a Stager since 2007. My web site includes Before and After shots. My company does mainly Savannah and surrounding islands: Hilton Head and as far as Charleston, S.C. I am a real estate agent and a member of RESA-PRO. Does this accreditation count? Does the fact that you ask for a referral fee apply to my business without the Staging Diva course? Many thanks for any information you send my way! Helen Marshall Savannah,Ga. Hi Helen, Congratulations on your real estate and staging business. As explained in the home staging job post, this position is available only for graduates of the Staging Diva Home Staging Business Training Program. The referral fee applies if I have to invest my time playing match maker between the client and the person I’m recommending. There is no referral fee for members of the Staging Diva Directory of Home Stagers. That’s one of the many perks of membership.Thanks for writing and I wish you every success in your business.